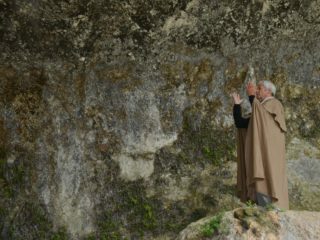 Jean-Paul Auriac offers an invocation in Occitane, welcoming the WISN team to the sacred sites of Dordogne, France. Occitane is an ancient language of Languedoc once widely spoken in the South of France. In the interest of imposing an official language throughout France, Occitan was actively discouraged and suppressed (often-times violently) causing Occitan to go underground. Auriac is part of a resurgence of Occitane culture. An author who has collected the stories of his ancestors from community elders over the course of 30 years, Auriac has created a popular story telling series using both French and Occitane to express these stories. Where it was once forbidden and considered shameful to speak Occitane at schools, schools now invite Auriac to speak about Occitane culture and language. Through various projects, WISN supports the preservation of language diversity.